The memories you have created on your boat make it very precious and placing a monetary value to it may become a bit of a challenge when you want to sell it. Or you just may not have the knowledge needed to value it. And the same is true on the buying side - you want to make sure when buying boats, that you are not overpaying. Well that is why the NADA Guide is one of the best places to go when you want to determine the value of your boat. One of the most common questions we receive at Nada Book Info is, "How do I find my boat's value?" It may seem simple for many of you on how to value your boat, but it is understandable that many people may not know how to use the NADA Guide website to determine the value of the boat. There are a lot of different options to choose. But don't worry, below we will walk you step by step, and by the end of the article you will be sailing right through! WHAT GUIDE DO I USE TO FIND MY BOATS PRICE? 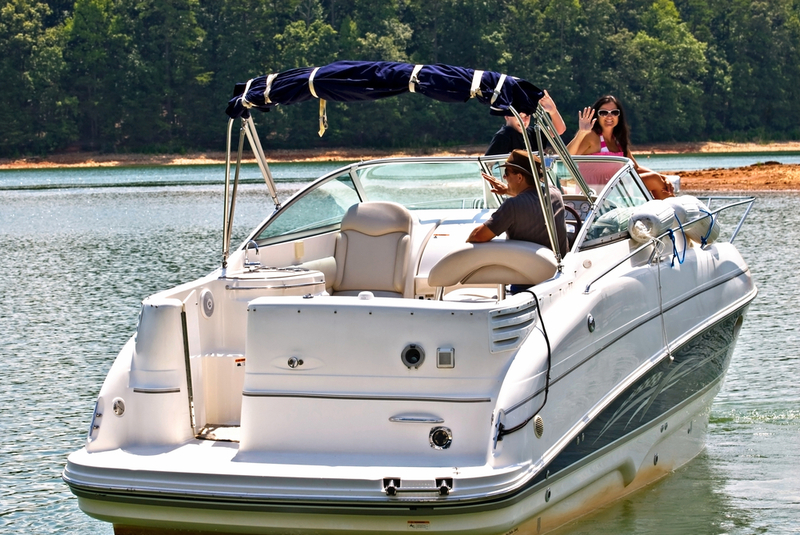 NADA is the blue book that both buyers and sellers refer to when trying to price a water craft. In fact most banks refer to it when they are considering giving out a loan with the boat as security or if the client is considering buying a boat. The NadaGuides.com website is where you will want to start off to determine the selling price (or purchase price) of a boat as it will give you the low and high value of the boat. 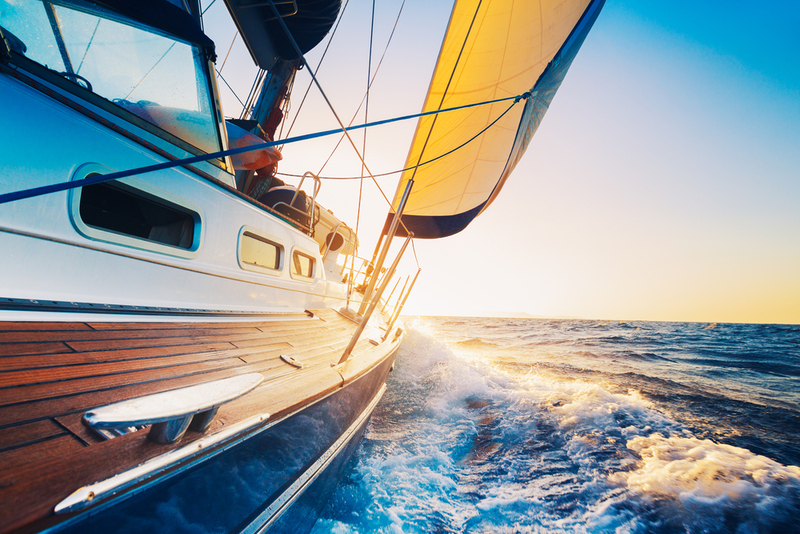 Off course you should understand that NADA may not be able to ascertain the actual condition of the boat so damages to it may bring down its value when the bidding starts, but you may not get that information there. Once you click on that you will be directed to the page that lists all the manufacturers. However, you will be greeted with a pop up box that is going to ask you for your zip code. 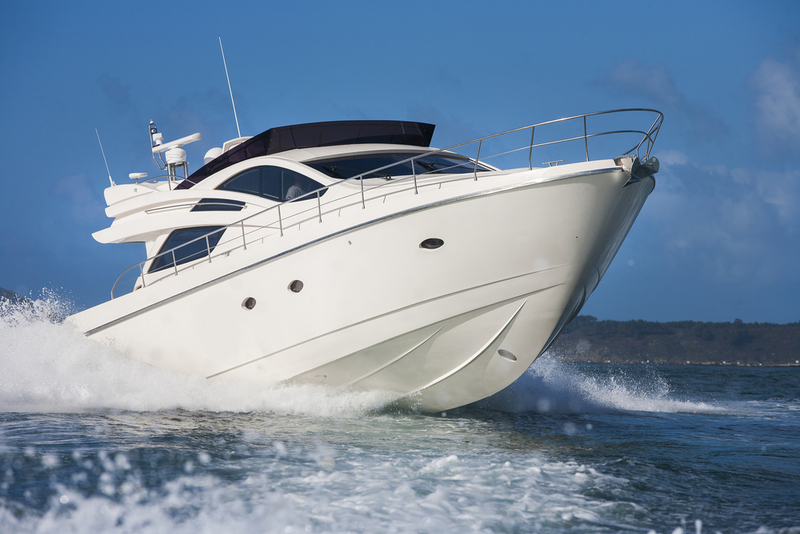 Typically, boats sell for more when they are closer to the water, so make sure you enter the correct zip code. 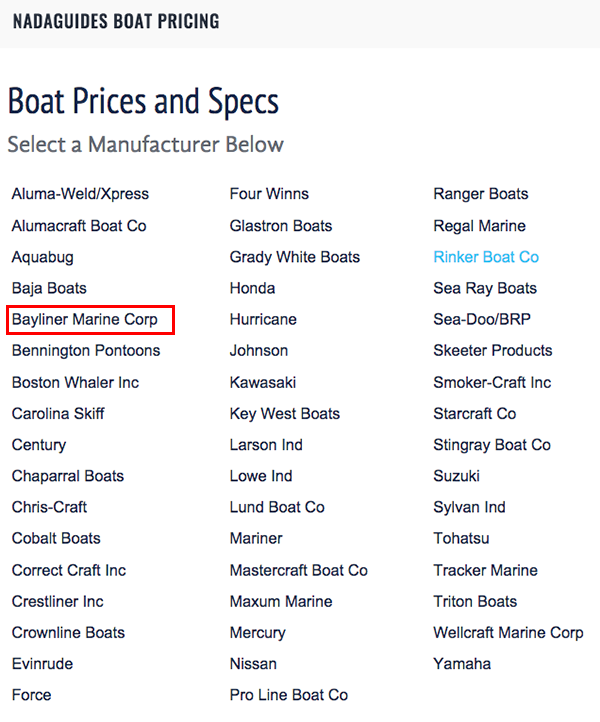 Once you do, the site give you list of the different models of Bayliner boats and you should look for yours. Now here is an important note. You will see a special note that will tell you if the pricing includes the trailer, outboard motor or even both. 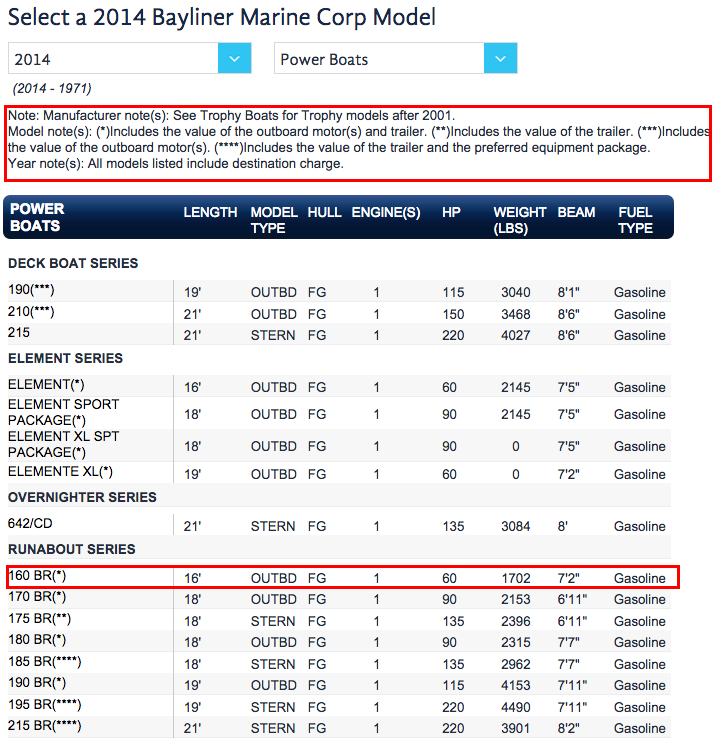 Each manufacturer on the website will have it differently, so make sure you pay close attention to this so you don't value your boat incorrectly. For example, with our Bayliner 160 BR, it says that the pricing includes the outboard motor(s) and trailer. Once you click on your boat, you will be directed to a next screen that will have the options of a detailed checklist to choose the exact specs that you would like to be included in the valuation. Canvas: Boat Cover- 7 ft. thru 14 ft.
Electronics: Auto Pilot w/Remotes – boats to 20,000 lbs. Now after choosing this all you do is click on continue and you will be directed to another page where you can input details of the outboard engine and trailer. Lets choose 130 – 149 HP and for the trailer we will choose a 2014 model and Tandem axle and for the length we will choose 17 feet. Below that you will see the miscellaneous optional equipment, lets go with aluminum step plates (4) and Fenders chrome (Tri Axel) Per Pair. 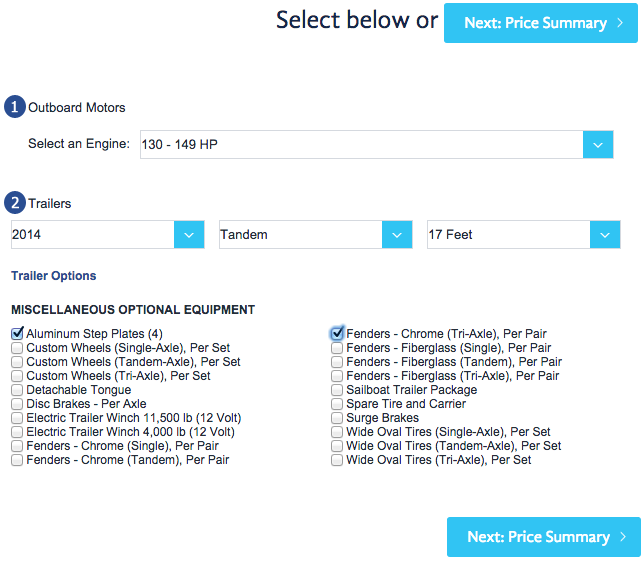 Now you can click next price option and it will give you the complete pricing for the boat. You might have a pop-up asking for your ZIP code in case you didn't enter it earlier so that you can get the price according to the area where you are. Here we have used 91011 so we have suggested list price as $14,042, Low retail with the options we selected is $21,295 and average retail is $23,675. These prices will change as time goes by so make sure you always price your boat as close to possible as the actual sale. WHAT DO I DO WITH THE NUMBERS FOUND ON NADA FOR MY BOAT? 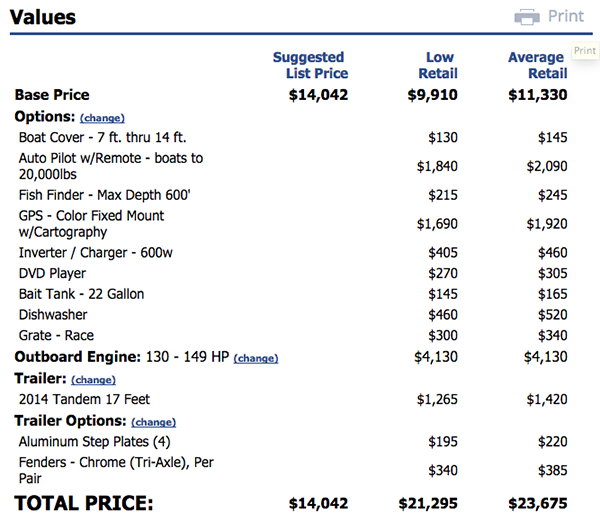 With the blue book value, you are now able to state your average asking price which can either be below or above the range and when you indicate this price, be sure to state the specs that justify the pricing as many potential buyers will go through this same process and may wonder why you have chosen a particular price which is not exactly what their calculations show. Now this calculation is not enough to determine the value of your boat. It's a great starting point, but you will want to find out the price range of similar boats. You could have a rare boat or one that is in demand, which means you can charge more. To find this, you can still do this on NADA by checking the pricing for other boats of similar models with similar specs as yours. There are also websites we recommend to look for boats, such as boats.com which has a list of different boats for sale. WHY SHOULD I TRUST THE NADA GUIDE FOR PRICING MY BOAT? You however should be assured that NADA is one of the best options, because it carries out monthly surveys on pricing of different boats, gathering the prices from dealers of new and used boats and does extensive research on the pricing of the accessories and what determines the pricing so you probably would find the most accurate prices here than anywhere else. 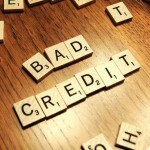 It's no wonder why so many dealers, banks, sellers and buyers rely on this guide so heavily. However as a result of different variables including sentimental attachments, you may find that most of the prices quoted by NADA may be slightly on the lower side which is why it is okay for you to have an asking price that is a bit higher than the average range. All factors considered, NADA is a guide and not a rule book. You want to also make sure you have the correct specifications and options of the boat you are trying to value. Engine models, and horse power can make a big difference to the pricing and getting them wrong will leave you with a wrong price as well.